Even though Anna Bolz has been at NYC’s Per Se for nine years, starting as chef de partie and working her way up to her current position as the pastry chef for the three Michelin-starred restaurant led by renowned chef Thomas Keller, every day is still a challengeÑand she wouldn’t have it any other way. Bolz’s drive for perfection can be traced back to her days of studying music at Luther College in Decorah, Iowa. There, while working towards her degree in musicology, she relished the process of starting with a piece of music she never played before, initially being awful at it, and then, step by step, working towards making it the best piece of music she could play. Or so she would think. Comments from the conductor would inevitably point out things Bolz had missed and she’d head back into the practice room all over again to make it better. But before Bolz found herself in one of the world’s best restaurants with one of the world’s best chefs at its helm, she was working part-time at a restaurant in a small Iowa town making a few pastries in between classes. Baking was a childhood passion for Bolz, who found herself attracted to the precise execution it involved. Having a sweet tooth didn’t hurt either. “I can eat desserts for days,” she says. Those few hours led to more as Bolz realized she enjoyed cooking more than playing music. “It didn’t feel like work,” she said of her time in the kitchen. Bolz headed to the International Culinary Center in New York where she received her pastry and baking certificate. After graduation, she worked in the kitchens of Porterhouse and Jean Georges. 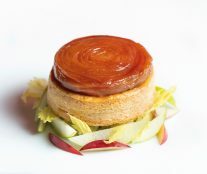 She joined the pastry team at Per Se in 2009 under then Pastry Chef Elwyn Boyles, who is now the executive pastry chef. 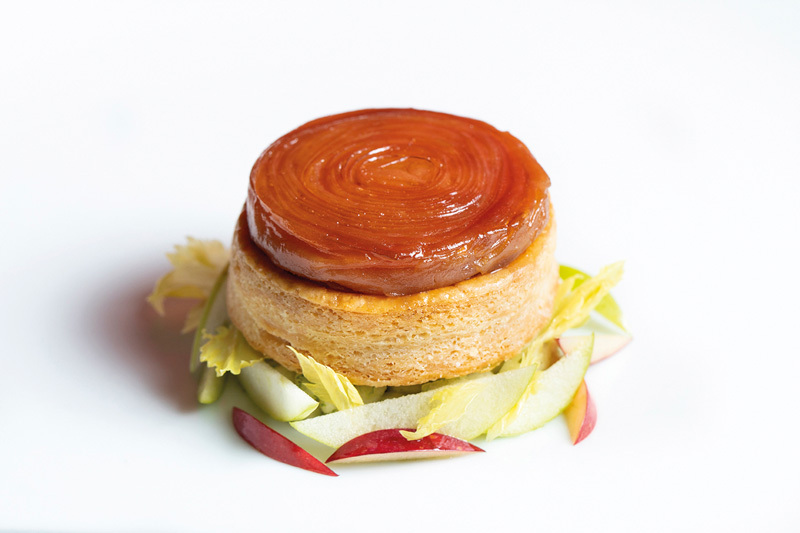 Boyles oversees the pastry programs at both Per Se and The French Laundry although he is the first to admit that Bolz runs the department at Per Se. “My job is to keep the creativity going in both restaurants, keep the chefs inspiring each other and make sure we are all going in the same direction,” says Boyles. That group effort starts at the beginning with the ideation process. 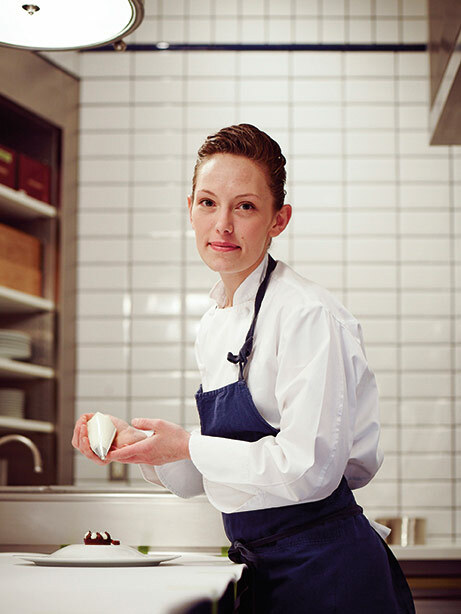 While Bolz doesn’t like to limit her inspirationÑ“It can come from something I’ve eaten, seen at the farmer’s market or thought about it,” she saysÑmore often than not it starts with a conversation in Per Se’s kitchen. “When you are surrounded by so many creative people, you could also just look across the pass and get new ideas,” she says. At the end of day, Bolz is aware that pastry, unlike eating, isn’t a necessity. 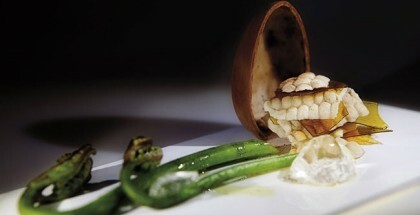 And as a luxury experience a lot of people look at Per Se that way too. “To be the pastry chef at Per Se is a luxury on top of a luxury,” she says, with the challenge of being the closer on it all. “You have this amazing experience and now we are going to give you one more thing that you definitely don’t really need. But we still want it to be impressive and something that makes you look at your experience here and say: Yes, that was worth it.” And she wouldn’t have it any other way. The end of summer is always bittersweet when you live in a four-season climate, and finding its flavors mid-winter is a reminder of slower times, like a sun-soaked afternoon by a lazy river. We try to preserve the flavors of summer as best we can by making infusions and distillations of herbs and flowers, drying and canning produce, and packing away as much flavor and color as possible. 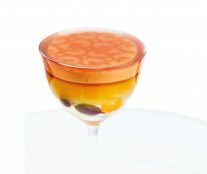 We discovered ‘peach nectar’ last summer after sugar crusting and baking peaches for the menu at The French Laundry. As the trim pieces sat, juice collected underneath them, and it turned out to be even more ‘peachy’ than the peaches themselves. This juice made its way into several desserts, and finally into jars to pull out later in the year. 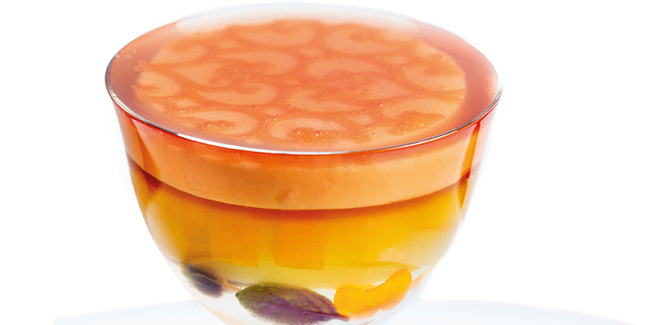 This particular layered jelly brings together all of the stages of peaches, from spring blossom to late summer fruit, in Jell-o-like layers reminiscent of so many childhoods. To make the peach leaf distillate, place a tall cake ring in the center of a tall, straight-sided pot. Wash the peach leaves well and pack them around the cake ring in the bottom of the pot. Add just enough water to make the leaves look swampy – wet but not floating. Place a bowl just smaller than the diameter of the pot on the ring. Cover the pot with a large bowl and fill it completely with ice. Heat the pot over high heat until it starts to steam around the sides of the ice bowl. 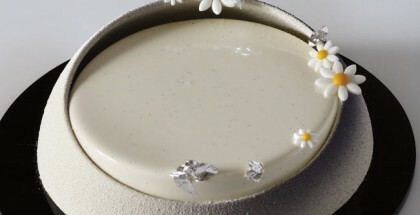 Turn the heat down to medium-high and allow the ice to melt as the condensation collecting on the underside of the ice bowl drips back down into the bowl on the cake ring inside the pot. After 8-10 minutes, transfer the contents of the small bowl into a container set to the side; taste and reserve. Return the small bowl and ice bath to their pot, and continue to steam the leaves, collecting the water in the small bowl. Transfer the distillation every 8-10 minutes, tasting each batch before combining it with the previous batches. When the flavor is no longer pleasant, empty the pot and begin again with fresh leaves and fresh ice. Scale 300 g of distillate and season it with sugar, stirring to dissolve. If necessary, reheat to dissolve the sugar. Add the gelatin and stir to dissolve. 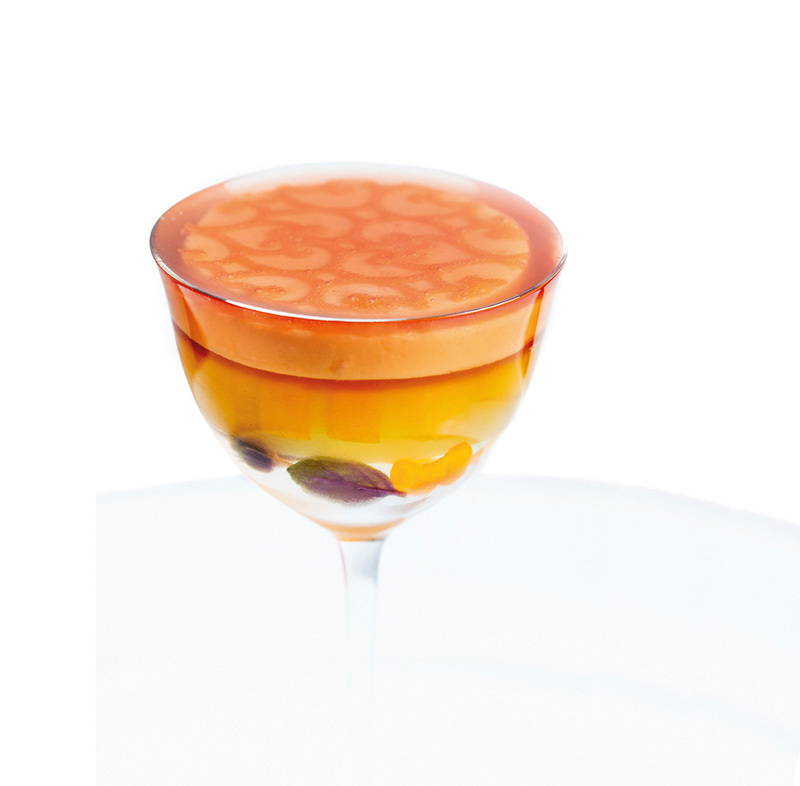 Strain the mixture into a bowl set over ice and stir until cool, taking care to not incorporate any air bubbles. To make the marigold tisane, pick the blossoms from the stems and submerge them in a small quantity of water. Add cinnamon sticks and vanilla, or other aromatics as desired, and cook over low heat until the water is flavorful and delicious. Add fresh aromatics such as lemon peel, green tea, or spices at the end if desired. Strain the marigold tisane, and season it with peach nectar. Heat the crushed kernels and cream to 65¼C, remove from heat, and transfer to a heat proof container. Cover, cool, and allow to infuse 24 hours. Strain through a chinois and reserve the liquid. Discard the crushed kernels. Re-scale the infusion to 288 g. Line a 6×6 inch container with plastic wrap and a single sheet of acetate across the bottom. Lightly spray the acetate with pan spray. Pour the infusion into a small pot and bring it to a boil. Meanwhile, whisk the sugar and yolks until lightened in color. Temper the cream into the yolks. Return the mixture to the pan and cook over medium heat, stirring constantly, until thickened. Add the gelatin to the custard and strain it into a bowl set over an ice bath. Stir the custard until it is cool and beginning to thicken. Pour it into the prepared container and refrigerate until set. Combine the sugar and pectin. Whisk the mixture into the peach purŽe and bring it to a boil. Add the grated ginger and season the jam with lemon juice to taste. Strain the jam, then seal in sterilized jars for future use. To make the lace, spread a layer of jam into a stencil and dry it at 90¼C 0% humidity for 4 minutes. Spread a second layer of jam over the stencil if it is very shallow and dry the pattern for 4 additional minutes. Remove the lace from the stencil and cut as desired. You will also find at so good #21 this creation.